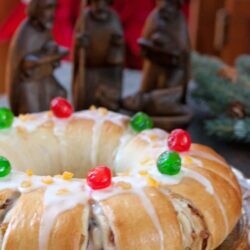 Do you remember my first Rosca de Reyes in 2012? That blog post still cracks me up – although it was not very funny at the time. Well, I attempted a different recipe amigos, and this time it came out beautiful and delicious. Ok, I have to admit, while developing this recipe, my first rosca did not rise, but this final recipe should be foolproof. When it comes to baking, I believe it’s very important to go into your kitchen with positive thoughts and in a happy mood. Happy baking makes for beautiful baked goods. I honestly believe that, especially when working with yeast. 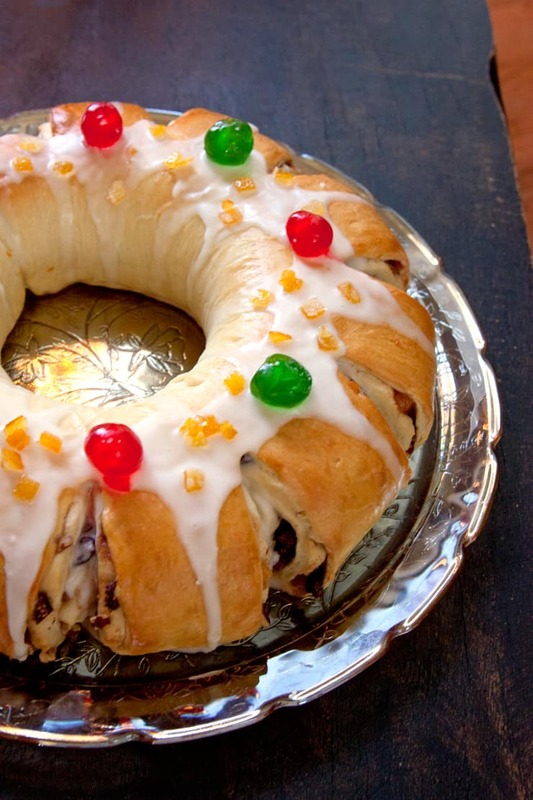 With the hustle and bustle of the holidays and so many projects and potlucks, I was tired of being in the kitchen, and when I first made this rosca, it did not rise. Yeast can be tricky to work with, but I added an added step to make this recipe easier to make. The first bread was not awful, but it just didn’t rise to the size I had hoped for, and it was not very photogenic. 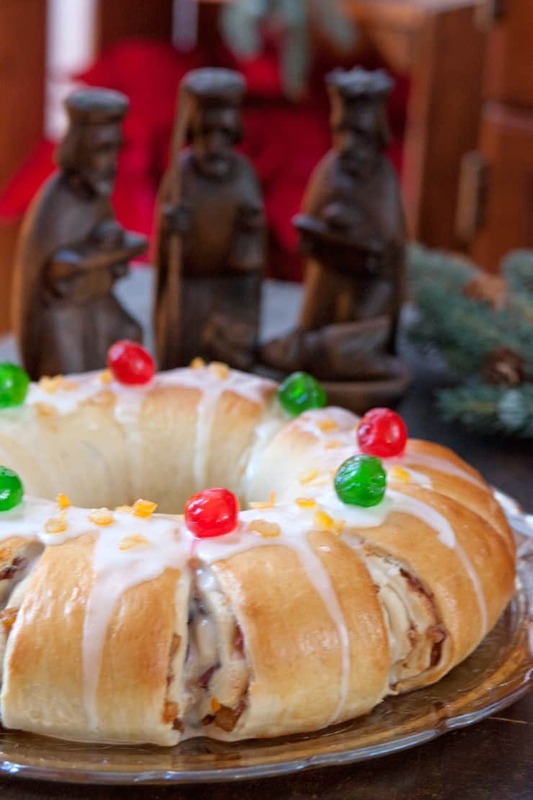 This recipe was inspired by a recipe I found in a vintage Better Homes and Gardens Mexican cookbook, combined with the flavors in my 2012 Rosca de Reyes. The dough is pretty basic, but with the addition of almond extract, vanilla extract, plus fresh orange zest, it gives the dough a lovely citrus flavor. 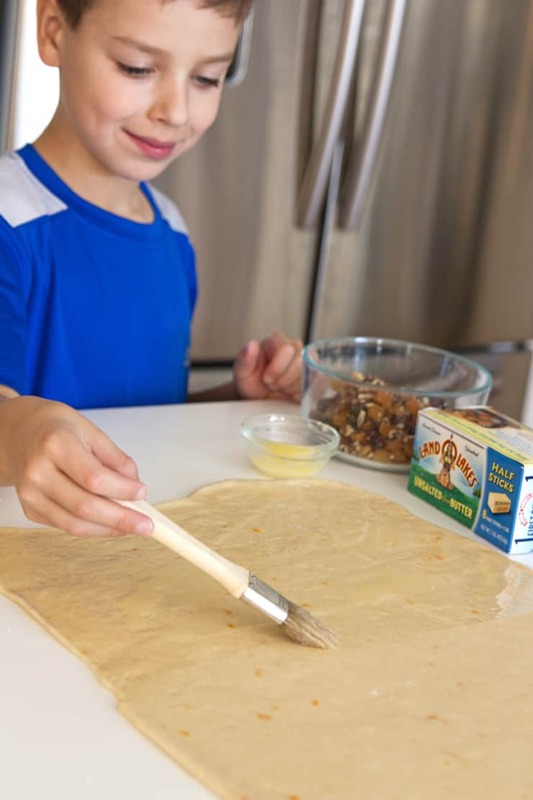 Once the dough rises, roll out and brush with melted Land O Lakes® Butter for a delicious buttery flavor, and sprinkle with mixed candies, fruits, and nuts combined with sugar and cinnamon. 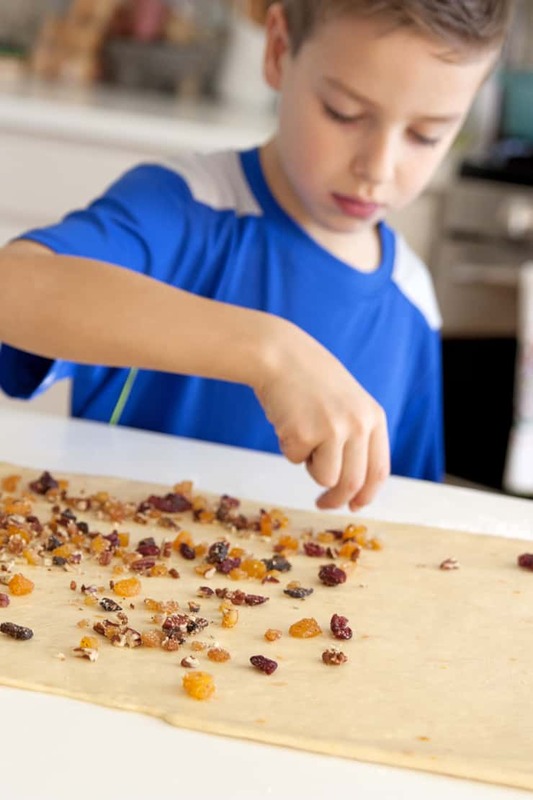 This was my sons’ favorite step – He sprinkled the dough with dried cranberries, figs, apricots, candied orange peel, and pecans. 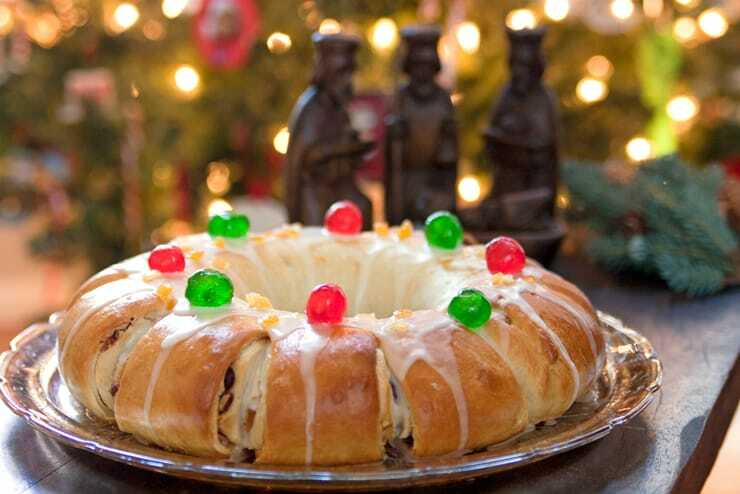 Most roscas are baked with the “jewels,” but I decided to add a powdered sugar glaze after it was baked and then adorned with candied cherries and orange peels. This rosca is glorious and I’m pretty proud of it, especially because it is displayed on my grandma’s antique rose iridescent platter. I have been saving this platter for a special occasion and this rosca was perfect. Rosca de Reyes come in a variety of shapes, sizes, and flavors. Traditionally, they are not filled, but I really like the flavors of buttery cinnamon rolls and wanted the same comforting flavors. Día de los Reyes is related with the traditions around the Epiphany on January 6th. This date honors the visit the Three Wise Men made to baby Jesus in Bethlehem. Traditionally, the bread is garnished with “jewels” to represent a crown. Usually a small clay or porcelain doll is baked inside, but I added a plastic baby doll after it was baked and sneaked him into one of the slits. Please warn your guests about the baby doll before you serve it. The custom is that whoever finds the doll must host a party on Día de la Candelaria (Candlemas Day) on February 2 and is also known as “Feast of the Purification of the Blessed Virgin” or as the “Presentation of the Lord.” This holiday is known as Candlemas in English, because candles are brought to the church to be blessed. Pour warm water into a bowl, and sprinkle with yeast. Stir with a fork until yeast has dissolved, and let rest until foamy. Stir in 1/2 cup of flour, and cover bowl with plastic wrap. 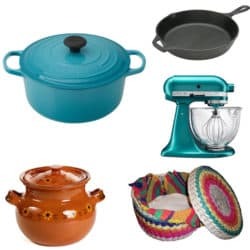 Place bowl in a warm place. Meanwhile, heat the milk and the 6 tablespoons butter in a small saucepan with the 1/3 cup sugar and salt. Cool the mixture to lukewarm. 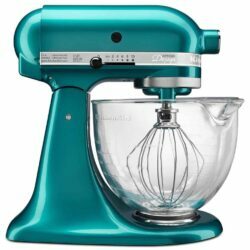 In a stand mixer combine the milk and butter mixture with 1 cup of flour, the 2 eggs, yeast mixture, vanilla extract, almond extract and zest from 1 orange. Beat at low speed for 30 seconds, scraping bowl constantly. Beat 3 minutes at high speed. Please note the dough will be sticky. 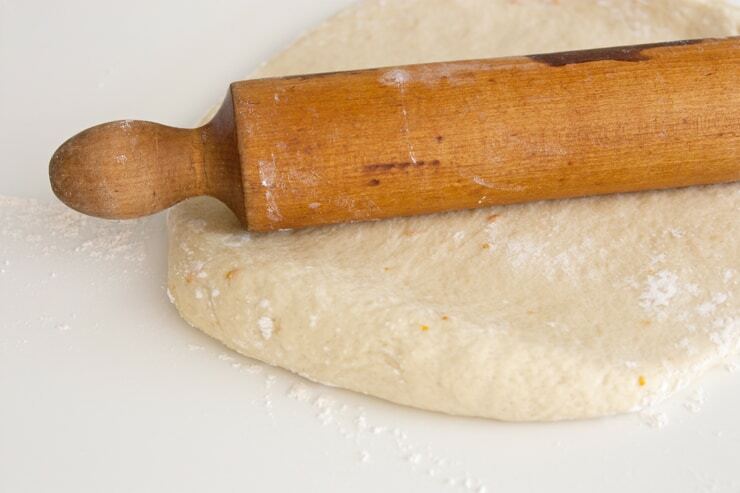 By hand, stir in enough of the remaining flour to make moderately soft dough. Knead dough on lightly floured surface 8 to 10 minutes or till smooth and elastic. Place in a greased bowl; turn once to grease surface. Cover and let dough rise in a warm place 1 to 1 ½ hours or till double. Punch down; turn out on lightly floured surface. 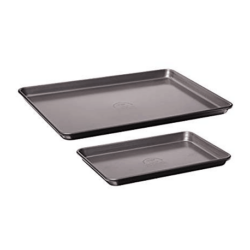 Roll dough to a 24x12-inch rectangle. Brush with the 2 tablespoons melted butter. Combine the 2 tablespoons sugar and the cinnamon; toss with pecans and mixed fruits and peels. 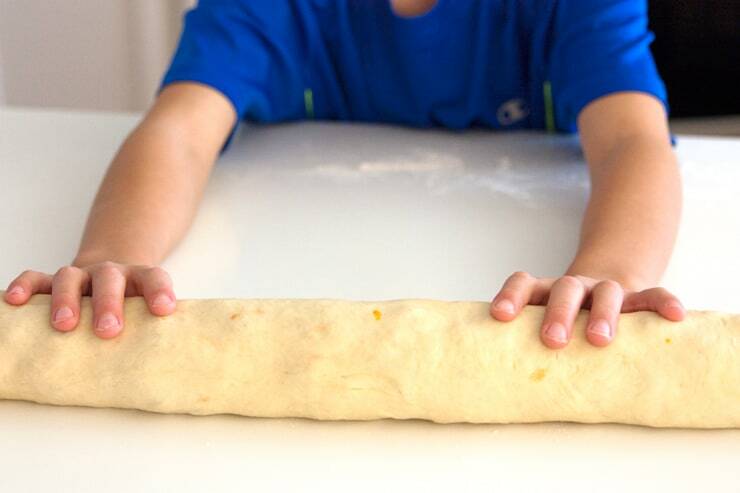 Starting along a long side, tightly roll up the dough. 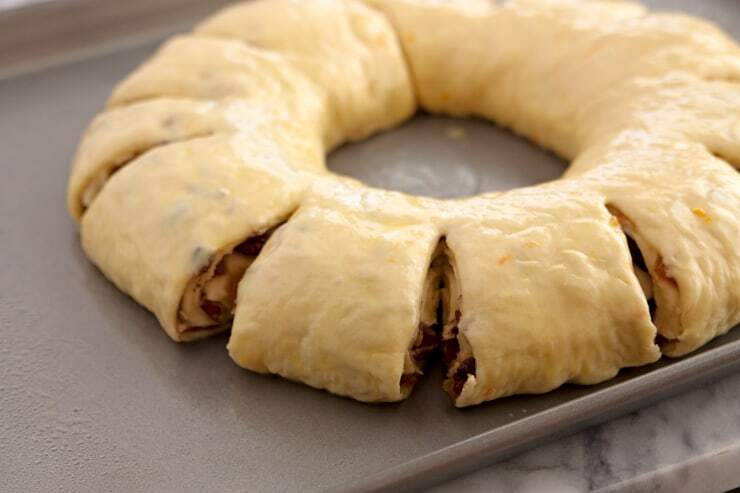 Bring ends together to form a wreath and place, seam side down, on greased baking sheet. 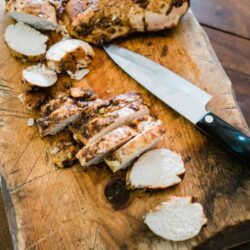 With a sharp knife make slashes at intervals around edge. Cover with greased plastic wrap and let rise until nearly doubled (about 30 to 40 minutes). Brush dough ring with the 1 beaten egg. Bake 25 to 30 minutes or until golden brown. Cool completely on wire rack. 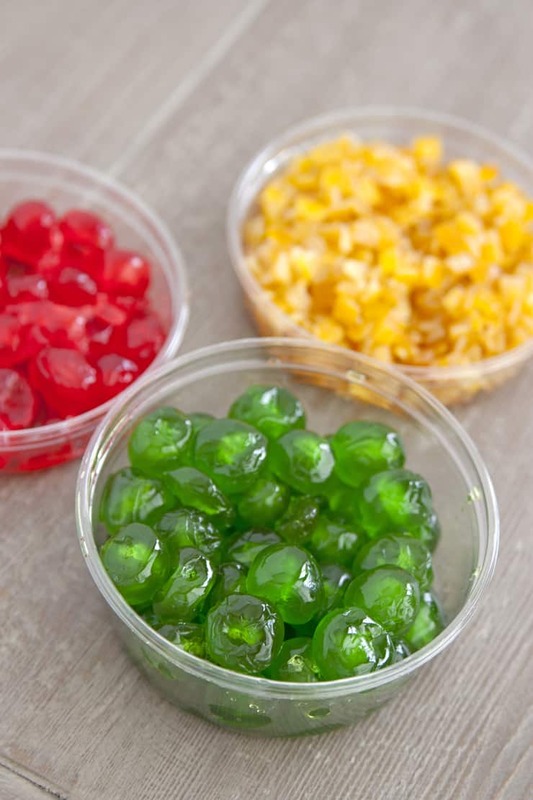 In medium bowl, combine all glaze ingredients until smooth, adding enough milk for desired glaze consistency. 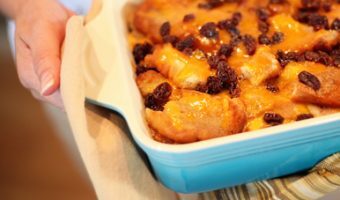 Spread over the bread and decorate with candied cherries and orange peel. 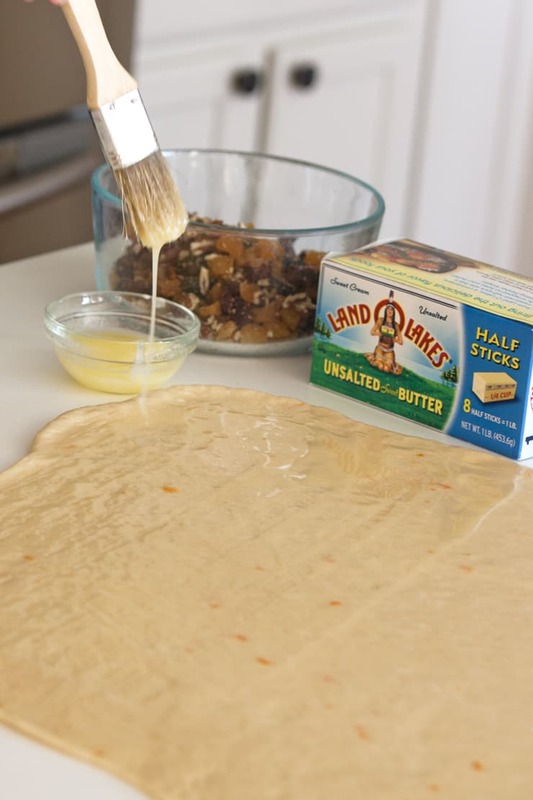 A special thanks to Land O’Lakes for sponsoring this blog post. Opinions are my own. ADD A LITTLE GOOD is a trademark of Land O’Lakes, Inc. 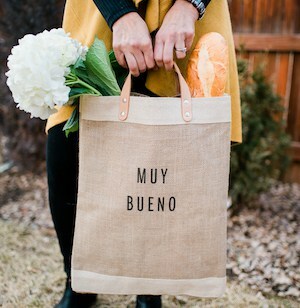 Thank you for supporting the brands that continue to make Muy Bueno possible. This was so yummy mija. I’m so happy you saved me a piece. 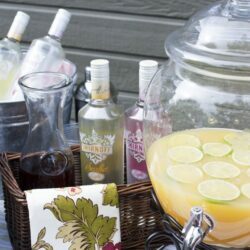 I have to make this for my Guadalupanas when I get back to El Paso. Woow yummy bread recipe !! I loved this bread.. I followed this recipe and it was such a delicious success, I made a second one! It’s delicious! The entire family loved it! 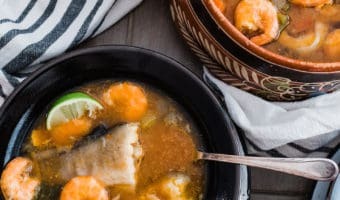 Thanks for the recipe, this one’s a keeper for my family archives, plan to make this every Dia de Reyes! I know I am late, but I didn’t have any other time to bake. Made my first Rosca de Reyes yesterday. Very easy recipe. Though the next day, I noticed that is us deflated. Normal? 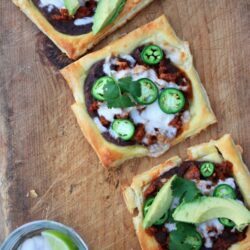 This recipe is an absolute winner! 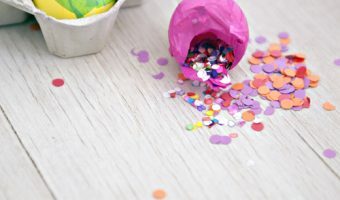 I tried it last year and LOVED it! 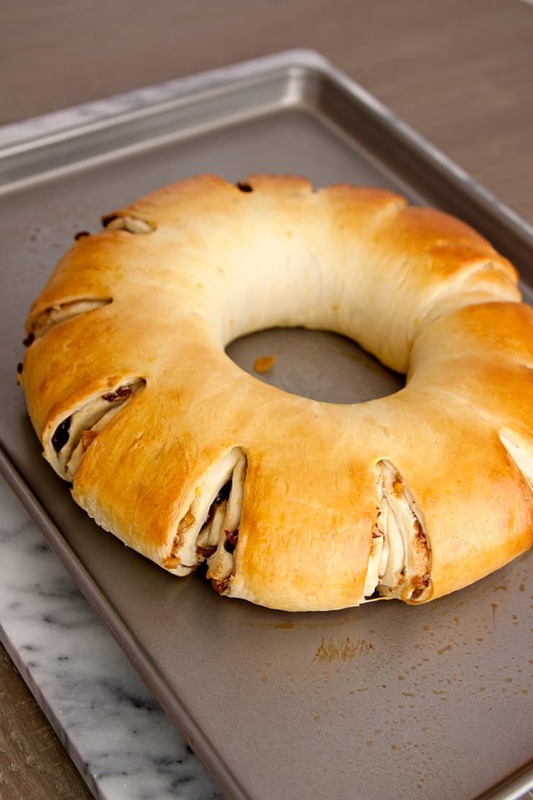 So many Rosca recipes call for multiple risings and a lot more work, I prefer something simple and fast, but big on flavor, and this recipe delivers on all that! It’s a keeper for me, I’ve included it in my family cookbook repertoire. So good. Thanks Yvette!